The Durian Kingdom is the twelfth kingdom in Donkey Kong Jungle Beat. This kingdom is characterized as a fortified mountain. In the original version of the game, it is the fourth kingdom linked to the J Barrel and can be accessed by completing all the kingdoms linked to the K Barrel and collecting eighteen or more Crests. In the New Play Control! version, it is the third kingdom linked to the B Barrel and is accessed by completing the Melon Kingdom. The Durian Kingdom is the dominion of Ninja Kong. At the end of every level, Donkey Kong eats a giant durian. Battle for Storm Hill is the first area of the Durian Kingdom. In this level, Donkey Kong ascends to the top of Storm Hill. Cannonballs rain from the sky here, and they can easily hit the ape if he is not careful. Many Ninjapes also appear here and use a variety of attacks to slow down Donkey Kong, such as throwing shuriken, manning cannons, and directly fighting him. There is a fort in the level as well, and Donkey Kong must avoid the many Mini Elephant Cannons to climb it safely. Aerie Fortress is the second area of the Durian Kingdom. Donkey Kong utilizes his rope swinging and swimming abilities to make it through the heavily fortified fortress. 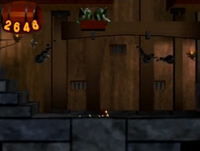 Similar to the previous level, Ninjapes use a variety of attacks to keep Donkey Kong at bay. This level also features Helibirds, which help Donkey Kong ascend through the fortress. Donkey Kong must then fight Ninja Kong. Ninja Kong is bulky with his hair held back. The battle takes place on a large pillar of stone with a storm going on in the background. During the battle, Ninja Kong attacks by punching and if Donkey Kong attacks back, he kicks, leaving him open for an attack. If halfway defeated, the process is repeated, but with Ninja Kong continuously kicking until he is open. After being defeated, Ninja Kong falls over into unconsciousness. This page was last edited on April 12, 2019, at 13:21.